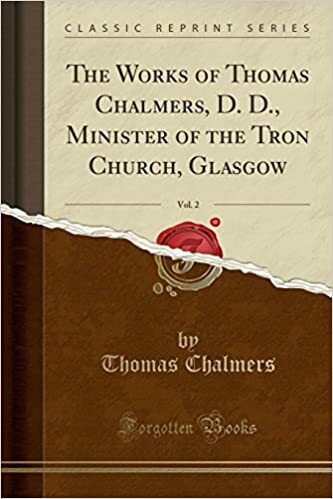 Some: theologians have exacted from an inquirer, at the very outset of his conv'ersion, that he should carry in his heart what they call the disinterested love of God. They have set him on the most painful eﬂ'orts to acquire this affection, - and that too, before he was in circumstances in which it was at all possible to entertain it. They have led him to view with suspicion the love of gratitude, as having in it a taint of selfishness. They are for having him to love God, and that on the single ground that he is lovely, without any reference to his own comfort, or even to his own safety. Strange demand which they make on a sentient being, that even amidst the fears and the images of destruction, he should find room in his heart for the love of complacency! And equally strange demand to make on a sinful being, that ere he admit such a sense of reconciliation into his bosom, as will instantly call forth a grateful regard to him who has conferred it, he must view God with a disinterested affec tion; that from the deep and helpless abyss of his depravity, he must find, unaided, his ascending way to the purest and the sublimest emotion of moral nature that ere he is delivered from fear he must love, even though it be said of love, that it casteth out fear; and that ere he is placed on the vantage ground of the peace of the Gospel, he must realize on his character, one of the most exalted of its perfections.